September 4, 2018. Kolkata. It’s quarter to five in the evening. The shanty dwellers in Majerhat felt the earth shake. A loud crash, dust rising from rubble and crumbling concrete, water splashing. The Majerhat bridge, running partly across a canal, had collapsed. A nearly 70-foot section came down, crushing many vehicles and killing one person instantly. Out of the dust and rubble emerged labourers of the metro construction site nearby. The Majerhat bridge has stood in the Alipore neighbourhood of Kolkata for more than 50 years. On one side is a middle-class neighbourhood. Its streets are lined with trees which cast cool shades on children playing cricket in the sweltering October heat. The other side overlooks the chaotic metro railway construction project – scaffoldings, rubble and heavy machinery – and a shanty lined road that leads to the Majerhat railway station. Considered an engineering marvel when it was built, the bridge now stands scarred and in the process of being pulled down, a testimony to the bad governance of public infrastructure in West Bengal. The railways, which has charge of a section of the bridge, had written to the Kolkata Metropolitan Development Authority (KMDA), warning that a section of the bridge was misaligned and that there were cracks. The state government, however, does not go beyond saying multiple agencies were involved in the maintenance of the bridge. The crash is not a one-off incident, though. Of late, a number of old and under-construction bridges have collapsed in various parts of West Bengal. “Every bridge has its own distress reasons and it has to be rectified according to the situation,” says Partha Pratim Biswas, professor, department of construction engineering, Jadavpur University. Broadly, he says, there are five main reasons for a flyover under construction, or an old one, for that matter, to collapse: design fault, poor quality construction material, faulty erection practices, lack of supervision during construction, and lapses in post-construction monitoring. Technical reasons apart, there is a deeper malaise. Biswanath Chakraborty, a psephologist and an observor of politics, says such things happen when a government tries to showcase its achievements and hurriedly fulfil its populist agenda. Many would also blame corruption rackets run by local syndicates that corner contracts and control the supply of labourers and construction material. Local strongmen with connections in the ruling party and the administration run such syndicates. Realtors are forced to buy materials from the local syndicate and employ labourers supplied by them. “If they don’t, they have to pay a commission per square foot. A part of the money goes to the party fund,” he says. So deeply is the “syndicate raj” entrenched in the social fabric of West Bengal that last year, even Krishna Bose, a former MP and the mother of Trinamool MP Sugata Bose, was not spared. The junior Bose called the syndicate an out of control Frankenstein’s monster. Unemployment is the root of the syndicate problem, says Chakraborty. According to the Fifth Employment-Unemployment Survey Report 2015-16, 13.9% of people with postgraduate degrees, and 9.8% of people who have completed undergraduate studies, are unemployed in West Bengal. Even chief minister Mamata Banerjee has decried the syndicates as it is seen to hurt her chances of bringing investment to Bengal. She had even directed the police to initiate a crackdown against those involved. “Industrialization and the rule of law is the solution to the syndicate problem. With more and more people finding work, the resources of the syndicate will diminish,” says Chakraborty. In March 2016, a 150-metre span of the Vivekananda road flyover in Kolkata collapsed with a loud crack and the rumble of falling concrete. More than 50 people died; 80 were injured. The National Disaster Response Force joined rescue operations. Rescuers extricated more than 100 people from the rubble. A survey ordered by the West Bengal government after the disaster found that 231 bridges in the state were damaged. Sixty-six bridges were red-flagged for replacement. Thirty were declared severely damaged, 85 moderately; 116 were noted as having minor damage. Recently, the state public works department declared seven bridges in Kolkata “most vulnerable”: 1) the Bijon Setu, a railway overbridge near Ballygunj; 2)the Gouribari Aurobindo Setu, between Ultadanga and Gouribari, of which almost all pillars are overdue for replacement; 3) the Belgachchia bridge; 4) the Tollygunje Circular Road bridge; 5) the Dhakuria bridge; 6) the Tallah bridge; and 7) the Santragachi bridge. Police has prohibited freight vehicles on the first four bridges and is thinking of a similar restriction on the other three. Thirteen more bridges in Kolkata are being inspected. Spaces below bridges and flyovers are being cleared of pavement dwellers to prevent casualties in case the ageing structures collapse. Roads at Kolkata port are in such bad shape that multi-axle freight trailers have been prohibited, hampering overland transport of shipping cargo. 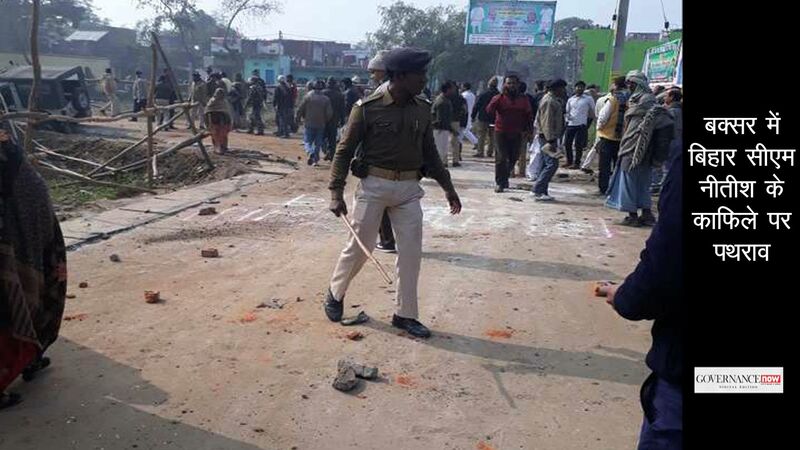 Across West Bengal, local bodies, especially in rural areas, do not have money for the upkeep of roads. So to forestall loss of rural votes because of poor roads, the Trinamool Congress government has brought many of them under the PWD. But the department, too, is resource-strapped to carry out repairs efficiently. Majumdar says professionals trained for smart monitoring are not easy to find, though the Central Road Research Institute and IITs offer short courses on repair and assessment. Jadavpur University has started the state’s first masters degree course in repair and assessment, he adds. A government consultant says the state PWD and KDMA do not inspect and report on old bridges; they might learn, he says, from the railways, which inspects and monitors its bridges daily. Set in place by the British, the work practice forbids the use of bridges that haven’t been cleared by a group of engineers that inspects it every day. But in the absence of such a system, road bridges remain uninspected and there is no accountability. Besides, administrative delays ensure that even if an engineer flags a bridge for repair, funds for the work aren’t released on time. In West Bengal, multiples agencies like PWD, KMDA, Kolkata Municipal Corporation, Kolkata Port Trust and Hooghly River Commission are responsible for the construction and maintenance of bridges, culverts and flyovers. 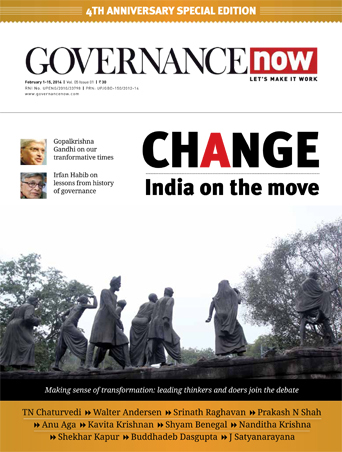 “Coordination between them is difficult and a single window system is the need of the hour,” says Biswas. There’s too much emphasis, too, on new constructions rather than maintenance of existing structures. 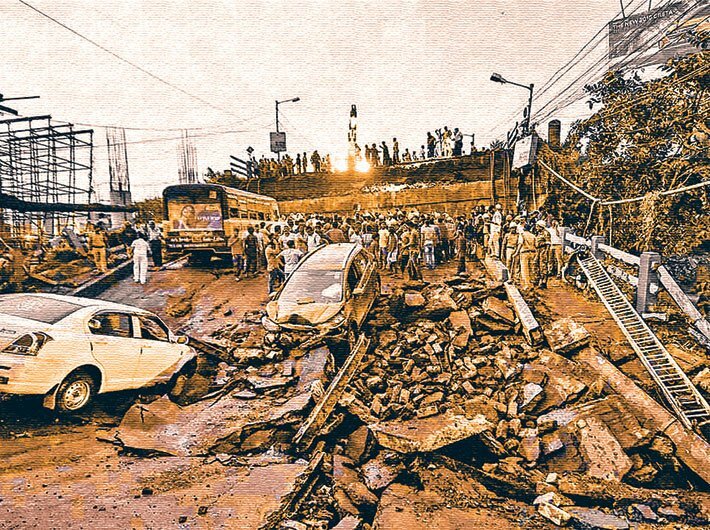 In the Girish Park neighbourhood of central Kolkata, a 150-metre steel span of the under-construction Vivekananda flyover collapsed two years ago. The remaining portion of the unfinished flyover stands in eerie testimony to the loss of 50 lives. Even to a layperson, what remains of the bridge looks dangerous. It blocks windows, passes through balconies and porticos, choking the residential area. In 2016, a committee led by then chief secretary Basudeb Banerjee had suggested that the flyover be torn down. Early this year, a team of IIT Kharagpur professors had seconded that opinion. The report deemed the soil poor and unsuitable to hold up the pillars. But no action has been taken. The state PWD had floated several tenders for the repair and maintenance of the Majerhat bridge prior to its collapse. The latest tender was issued in April for repairs, refurbishing and maintenance of the bridge. The work was supposed to begin in August and end in six to seven months. No company had responded to the first three tenders. Only one agency responded to the fourth but it quoted 15 percent more than the estimated project cost. The project never took off. RITES had observed that instead of removing old layers, fresh patchwork was done, which increased thickness and ultimately the load of the bridge. “Repairing an old bridge is a very meticulous job requiring a lot of effort, skilled person and machinery but the profit margin is not very high,” says Majumdar. Firhad Hakim, minister in charge, urban development and municipal affairs, and Aroop Biswas, minister in charge of PWD, could not be reached for comment. However, according to a source, the KMDA and PWD have constituted a committee to assess the health of bridges and has called on independent consultants for their expertise. “They are working to fast-track repairs and maintenance,” he says.